It’s no secret that I’ve never been a sports lover. This is probably because I’ve never found a sport that I’ve been good at and I’m a sore loser. Yet somehow, I married a sports lover and, since then, I’ve begrudgingly come to appreciate the pastime. I just don’t always appreciate them for the same reasons that John does. Below, I’ve shared a few reasons why my first NBA (pregame) experience was a blast, and why I hope we can make it a tradition. I’m not usually very interested in celebrity culture. I’ve never gone out of my way to track down famous people (even when one of my favourite actors was in my town) or even paid particularly close attention to their personal lives (any more than can be helped when scrolling through Facebook). It’s always felt silly to me that we get excited about someone just because we are used to seeing their face on TV. That said, there was something bizarre about being in the same room with a group of individuals you only ever associate with TV. I liked seeing the players in person, since it made them seem so much more real. I’m so used to seeing them behind a screen that I kinda forgot they are real people. It was also interesting to catch myself being excited about celebrity exposure. I was already looking forward to seeing one of my favourite players, Lance Stephenson, in real life because I find his attempts to distract other players during the game pretty hilarious. But I got an extra surprise when Muggsy Bogues stepped onto the court and started throwing out signed basketballs to the crowd. I don’t want to buy into our overly obsessive celebrity culture, but man, it sure is fun to see someone you recognize from a childhood film walking around in front of you. There are a lot of really good reasons that we demonize the hive mind that happens at sporting events. For example, it can result in ridiculous group temper tantrums that wind up leaving the host city looking like a wreck. However, this weekend I realized why the crowd mentality is so appealing. It’s a rare experience to feel united with nearly 20,000 people, but sporting events do their best to foster that feeling. Whether it’s cheering on the guy who was chosen for a blindfolded round of “find the mascot” or joining in on the wave, being part of the crowd gives you a hands-on understanding of what kind of power a large group of organized people can hold. If you don’t believe me, just ask Paul Pierce. He was booed by the crowd every time he touched the ball because of a comment he made about the Toronto Raptors last year. As you can imagine, he didn’t end up actually holding the ball for much of the game. 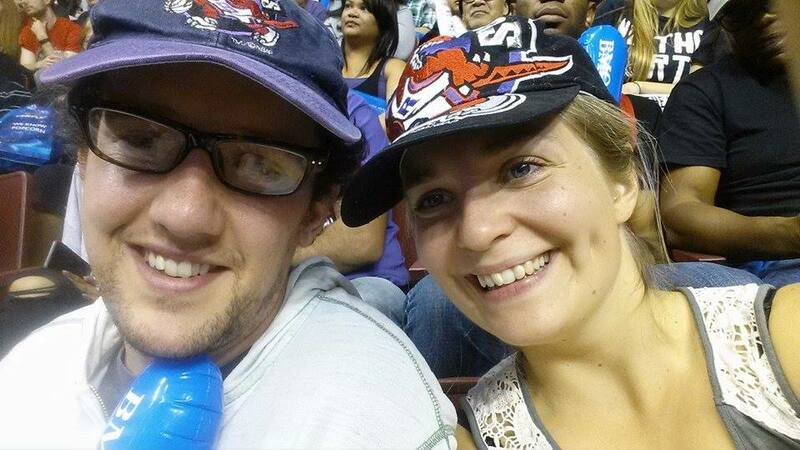 As much as I enjoyed my first professional basketball game, it didn’t transform me into a fan. Instead, my favourite part of the game was getting to share in John’s excitement. After all, you can make pretty well anything into an adventure if you’re with the right people. This entry was posted in sports and tagged basketball, boo, crowd, half-time, NBA, Paul Pierce, pre-season, Space Jam, sports, sports fan, television, the wave, watch. Bookmark the permalink.